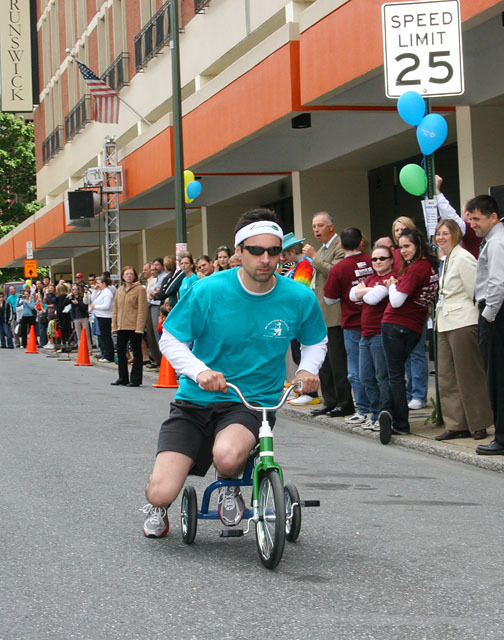 This photo was taken at the Lancaster Trike Race (a fundraiser for the United Way). Our company competes in it every year. The racer is Matt Harrington of Nxtbook Media, LLC. It's a nice event photo, although I'm not sure I would consider it a portrait. I guess the voters didn't think so either. Anyway, the event looks like fun -- you captured that nicely. Maybe if you crop some headroom and sliced it into three equal parts, it could be a "trike"tych! :} LOL! theres too many people in the background for a portrait. Im tired of looking through these photos and seeing submissions that arent portraits. with a portrait you shouldn't show below the subjects shoulders. Also the background is terrible, it takes away from your photo. I give it a 1. More a snapshot than a portrait. Hey man, with the price of gas, a guy's gotta do what he can to get to work. :) Portrait? I think not. But a point for humor nonetheless. Proudly hosted by Sargasso Networks. Current Server Time: 04/22/2019 06:17:48 PM EDT.